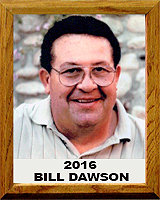 Bill Dawson graduated from Tucson High School in 1967. He was a 3-year varsity letterman in football, playing with the 1965 and 1966 state championship teams. He was MVP of the state championship game his senior year. During his junior and senior years, he earned all-city and all-state first team honors on both offense and defense. As a senior, KVOA named Dawson the High School Football Player of the year and he was named a prep All-American. He also played in the 1967 High School All-star game. Dawson wrestled in the heavyweight division. He was city champ and runner-up for state champion his sophomore year. He took the city and state championships both his junior and senior years. Heavily recruited out of high school, Dawson chose to play for the Michigan State Spartans. He was on the wrestling and football teams his freshman year. He was a starting defensive player his sophomore and junior years. A torn ACL kept him off the field his senior year, but he came back in 1971 earning Honorable Mention All Big Ten. Several times the MSU coaches presented Dawson with the Downtown Coaches Awards, given to the Spartan player of the week. He finished his college career by playing in the North-South All-Star Game in Miami. Following college, Dawson played semi-pro ball with the Flint Sabres before returning to Tucson. Dawson spent 32 years teaching and coaching in TUSD. He coached varsity football and wrestling at Tucson High, both as a head and as an assistant coach. During his years at Pueblo, he was an assistant football coach. He was inducted into the Tucson Hall of Fame in 2001. Bill in the brother of Pima County Sports Hall of Famer Mike Dawson.